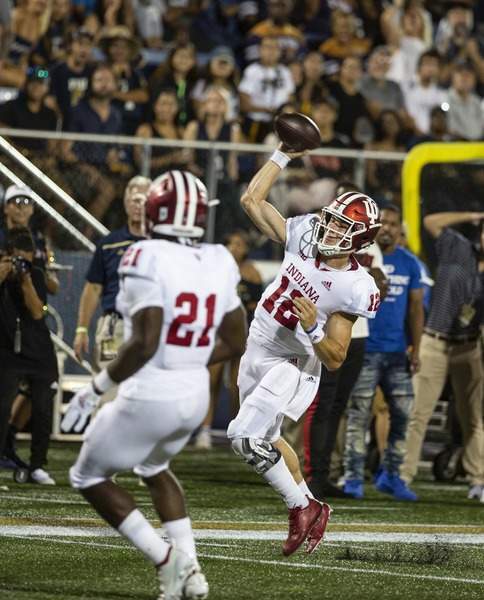 Associated Press Indiana quarterback Peyton Ramsey throws during Saturday's game against Florida International in Miami. Indiana won but lost running back Cole Gest to a season-ending knee injury. Indiana coach Tom Allen spent the whole offseason stressing the need to create more turnovers. He witnessed the payoff in Saturday's season opener. After forcing three turnovers in the first half, including an interception return for a touchdown, it seems that the Hoosiers understood the message – even if they didn't play the perfect game. A year ago, the Hoosiers (1-0) forced only 13 turnovers in 12 games. So the fast start against Florida International certainly was a welcome change – especially given the predicament Allen has been dealt on offense. Last week, he announced backup quarterback Brandon Dawkins had left the program and starting running back Morgan Ellison had been suspended indefinitely by the school for an undisclosed reason. On Monday, there was more bad news. Ellison's replacement, sophomore Cole Gest, will miss the rest of the season after tearing the anterior cruciate ligament in his knee. Gest carried only five times for 17 yards in the first half Saturday before leaving the game. He was the Hoosiers' second-leading runner in 2017. It's the third consecutive year the Hoosiers have lost a key player with a season-ending injury in the first two games. Nick Westbrook, the team's top returning receiver, suffered a torn ACL on the opening kickoff of last year's opener against Ohio State. The previous year, Indiana lost its No. 1 receiver, Simmie Cobbs Jr., with an ankle injury on Indiana's first possession in Week 2. Cobbs was suspended for the 2016 opener. Allen will turn to senior Mike Majette, fifth-year senior Ricky Brookins and freshman Stevie Scott to carry the bulk of the load – at least until there's some clarity on Ellison's situation. Allen still needs answers on defense, too. Although safety Jonathan Crawford played a part in two of the turnovers, including the interception return, Allen didn't give the defense high marks. He expected more out of the front seven, thought there were too many blown assignments and certainly expected better discipline than giving away first-down conversions three times on third-down penalties. The problem, of course, is the learning curve becomes much steeper this week when Indiana is host to bowl-tested Virginia. Allen's experienced defense made things challenging on the Cavaliers in last year's 34-17 victory at Charlottesville. But what he needs to see this week is a defense that plays better, more fundamentally sound football and still comes up with the game-changing plays.